I love millinery - hello nothing new here. But it wasn't until a friend of mine started sporting some amazing matchy matchy numbers that I had to ask - girl who are you wearing up there - Helen Strong hmmm a little insty stalk later and I was in love!!!!!!!!! OH MY LORD is it a angel? a goddess? well yes all these things because Helen is a amazingly talented milliner!!! In the lead up to spring carnival I thought it would be great to know a bit more about this supreme being and let her share with us, her passion, her authentic love of millinery and of course where it all began. I have been hooked on fashion and millinery since winning my first sash at the Gympie races last year. But it really all started about 13 years ago, when I was a struggling uni student. I had scored my dream part time job as a milliner’s assistant for the very talented Wendy Duff. I made my first hat for myself (with the help of Wendy) and won a runner up prize in FOTF at Corbould Park Racecourse in 2005 and I was completely hooked. However after I graduated from university, I decided to concentrate on my career as an art teacher, so millinery fell by the wayside. It wasn’t until last year, when I was invited to attend the races in Gympie, that I decided to make my own hat and won my first sash, again I was hooked. Next thing I knew, I was making hats for friends and then clients and now I have a small hobby millinery business that is really taking off. There is something so satisfying about making a hat from start to finish, matching and styling it with ladies beautiful outfits. Florals are a signature on Helen's creations. 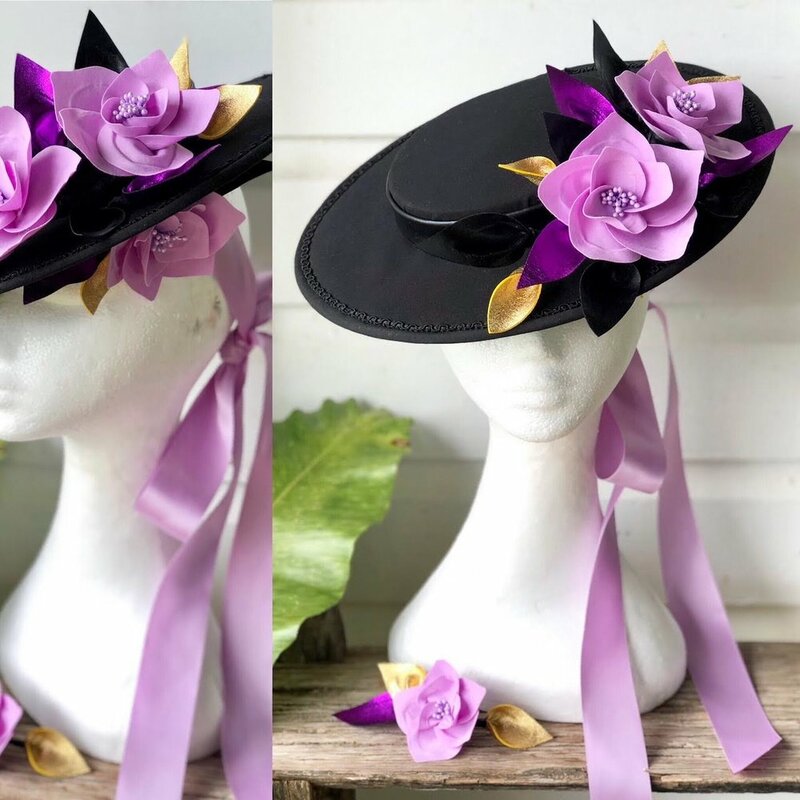 After working with a milliner for 5 years I have definitely picked up a lot of tips and tricks, but over the past year I have developed a personal style through my interest in craft, art and fashion. I feel like after each hat that I create I stumble across my own tips and tricks, producing custom hats that really stand out from the crowd. I would describe my style as floral, colourful, and fun. Yes Spring is just around the corner, while I am fully booked until early August, I have already began to take orders for Spring. When you have an outfit idea please contact me to start conversing about your next race ensemble! I would love to create a Spring collection, however I can only keep up with my custom orders at the moment due to working full time as an art teacher. But during Spring will be able to create a small collection which will be available from my Facebook page Hats by Helen at fb.me/HatsbyHelenStrong and probably advertised on the Millinery and Racewear for Sale Australia Facebook page, which is actually the page that has helped me become more well known. I will also be running a competition for Spring racing where you could win one of my fascinators. Thank you Helen for this amazing blog we look forward to watching your business continue to grow.